A Village Mama: Best Toys for Children - thanks Santa! Best Toys for Children - thanks Santa! My girls are 5 & 2 1/2 years old and every year they get lots of gifts from friends, family and us - most receive a few minutes of play and then sadly go on the shelf abandoned for the usual favourites. 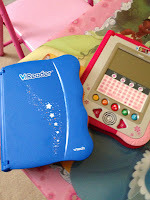 This year we received some of the best toys for kids (at least from my perspective). Not only have they endured past the first week of Christmas but they are on track to be long time favourites. I would highly recommend any of these if you are looking for something to engage your kids. My sister in law is always great at finding a gift my girls will love. This year it was the Barbie Hug 'n Heal Pet Doctor. Both girls received one and to ensure no fighting the only difference was the bag colour (pink/purple) and the colour of the dog inside. 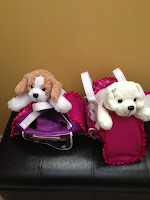 The dogs come with their own bag, vet supplies (needle, bottle, etc. ), prescription pad and a registration. 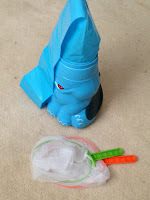 This is a great toy for role-playing and the girls immediately donned the stethoscope to give their dogs a check-up. My five year old is more sophisticated with her play but she actually includes her sister and they (gasp!) play together! The dog is also good for cuddling and has found a forever home with my girls. I should mention the dogs also "talk" which quite honestly we could have done without - it doesn't add to the play and the girls are not that interested in that part - they prefer to create their own story and dialogue for their pets. This was a great choice for the girls as the rules are simple (catch the golden butterfly) and it's a lot of fun. The game runs on batteries and you load the paper butterflies into the elephant and then turn it on. The trunk extends (via air) and the butterflies come out and float through the air as the kids try to catch them in the nets (included). Although the recommended age is 3+, my youngest (2 1/2) has no problem understanding the concept however, she doesn't understand the "winning" yet which is probably a good thing with a competitive 5 year old in the house. While I wouldn't consider this game educational per say it does get the girls moving and it's fun which really is the whole point. It's a two-player game but my girls both are happy to play at catching the butterflies by themselves if no one is around. My mom purchased one of these for my oldest daughter when she was 3 years old and it was the best investment ever made. You insert a story cartridge into the system, turn it on and voila you can watch a story. The system is easy to use for children and they can follow along as a story is read to them (perfect break for parents too! ), there is a dictionary feature which allows them to find out what a word means - my inquisitive child loves this and there are reading games. The story cartridges are age-based (3-5, 5-7) and as your children gets older they are able to use different activities and play games independently. I knew that my 5 year old would not share this toy with her sister so I asked my parents to get one for my youngest this Christmas. The style is a bit different but the cartridges are interchangeable and you can download from the Internet as well. My 2 1/2 year old quickly figured out how to work her e-reader with some help from us and her sister and now she is able to play with it by herself. The best part of this is that it helps develop their reading skills in a fun and interactive way. 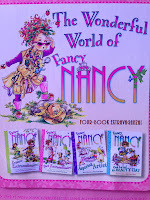 We bought a gift set of Fancy Nancy books for my five year old and she loves them! My oldest loves to read and she's actually quite an adept reader although she prefers to be read to. I know that many of the books she has don't challenge her and she's not ready for books that are "all words" so these books are the perfect balance. She loves the stories and the fact that the books are very girly/fancy. The stories are a bit more advanced which keeps her engaged when I read to her and gives her something to strive toward when reading independently. 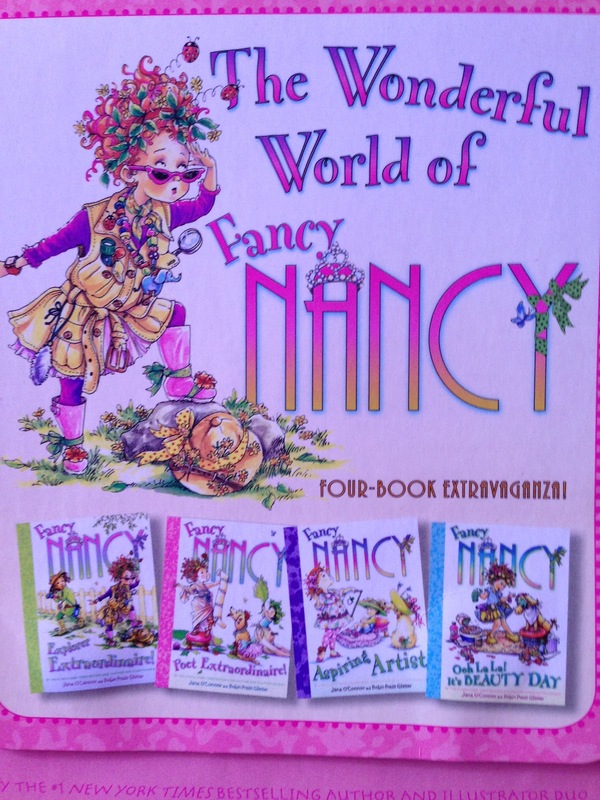 The "fancy" words with descriptions are great for expanding vocabulary and imagination. After reading Ooh la la it's Beauty Day, I was treated to a manicure and makeover (how lucky am I?) which just confirms that more than reading comes from a good book. This was a gift for my younger daughter, she likes her wood puzzles but they seemed a bit to easy for her and she got bored quickly so I went with something a for a bit older child (3+) that she could still manage. 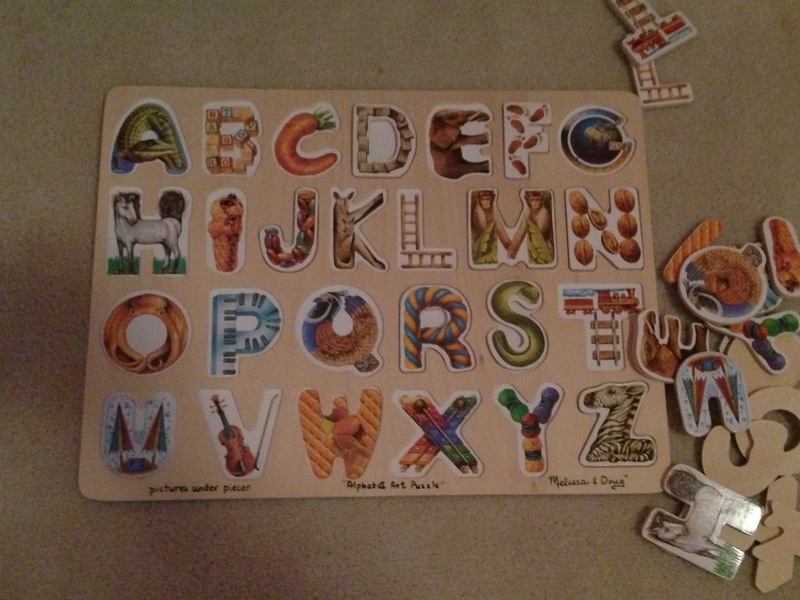 The Alphabet Art puzzle is not only pretty but the pieces are not quite so chunky making it a bit more challenging for those that have mastered the toddler style of wooden puzzle. She really enjoys playing with this and spends lots of time taking the pieces out and putting them back which is what I had hoped for. 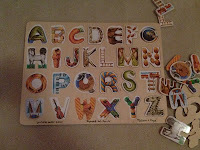 The great thing is that we can also play together and work on learning the alphabet and naming the pictures. This puzzle will grow with her so it's a keeper in my book and the quality of Melissa and Doug products ensures that it will last. That's it for my top toys of Christmas 2012...what are your favourite toys?